Aside from providing Uni students with a wide variety of books, magazines, and comics, the Uni High Library has a contribution to our school that surpasses all of that. When asked, their main goal is said to be creating an entertaining, but focused environment where students can connect with each other and their community. Looking back at the past month, our library leaders have done just that! 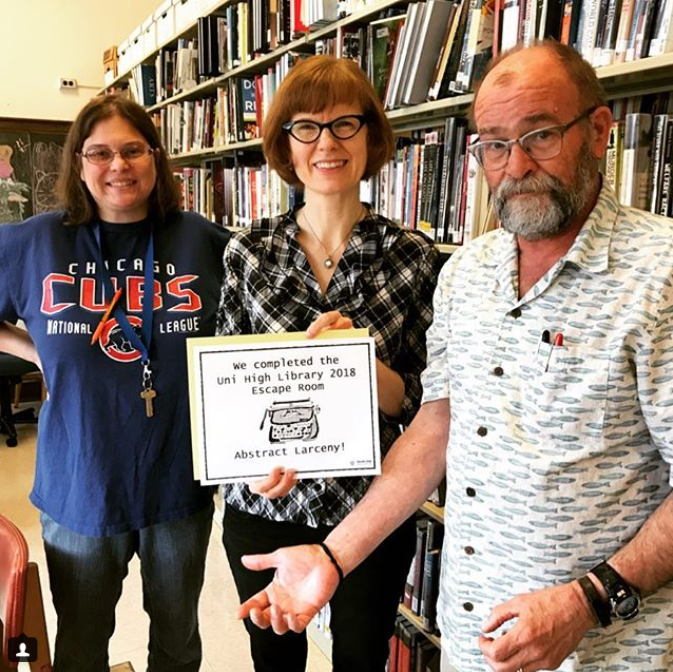 Led by Dominique Arnolds, Paul Kotheimer, and Vicki Pietrus, the library has hosted events both to integrate the Uni community, like a spelling bee and the Day of Silence events. These events, paired with activities to help ease the stress of students and teachers alike before finals, have made this last month as enjoyable as possible. On April 23, the library held a lighthearted, yet competitive spelling bee contest that pitted students of all ages against each other. This helped students have some fun in an academic fashion leading to the stress of finals. Nationwide, April 27 is the “Day of Silence” which serves as a day devoted to spreading awareness about the unfortunate treatment of LGBTQ students in school. The library held a live discussion and forum where students could voice their opinions about the Day of Silence and help resolve the bullying of LGBTQ students in our own community. Once again, the library’s community involvement is shown with their Illini Service Dogs event. Illini Service dogs are a local, volunteer-led organization dedicated to providing service dogs to Champaign County. On May 2, students were able to learn about the tremendous impact of Illini Service Dogs and even got to meet two of their dogs. This week, from May 7 to May 11, the Library and Thespian groups will be presenting their second annual Escape Room. Groups of teachers and students will have to find the props of actors from the upcoming Krannert Theatre performance. Like last year’s, the “Abstract Larceny” room offers the Uni High community an intricate and fun puzzle. From May 16 to May 18, the Library will cap off a strong 2017-2018 year with a stress-free activity comprised of board games, puzzles, and more to get our “thinking juices” flowing going into the 2nd-semester finals.